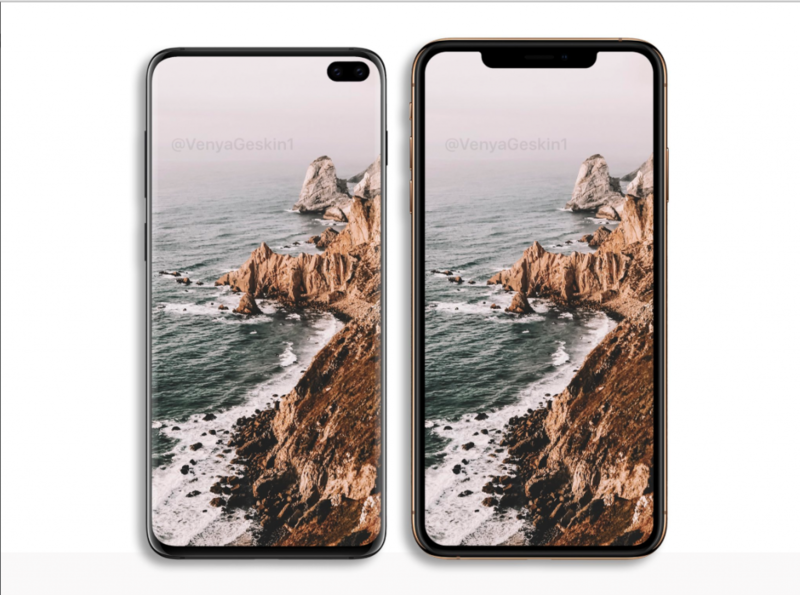 Recently, OnLeaks released a lot of Samsung S10+ renderings, which takes a clear look at Galaxy S10 Plus (S10+) for the first time, as well as confirmation details about Galaxy S10 Plus. Similar to Galaxy S9 Plus, an AMOLED panel with QHD resolution is used on the front of Galaxy S10+. As can be seen from the rendering, S10 Plus is equipped with three rear-placed cameras and an LED flash, and three lenses include standard lenses, telephoto lenses and wide-angle lenses. The Twitter bomber @VenyaGeskin1 made the S10+ bright screen contrast to the iPhone XS Max rendering chart based on these rendering diagrams, and on the whole, Apple’s iPhone XS Max is still a whole lap larger than s10+, thanks to the “in-screen camera” technology, Samsung s10+ overall screen share is better than the iPhone XS Max is a lot taller. On the other hand, Samsung Galaxy S10+ has a much narrower border than the iPhone XS max, which do you prefer belong these two design styles?